Victoria Falls is one of the largest and most famous waterfalls in the world, well-deserving of its nickname as “The Smoke that Thunders.” Gain greater understanding and appreciation of the World Heritage Site on this 2-hour guided tour of the falls, which includes a walking safari and information about the history and local wildlife of the area. 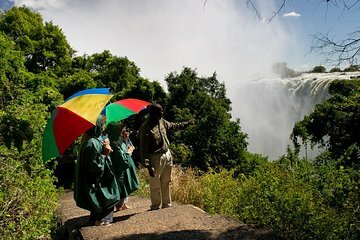 Meet your guide at your hotel in Victoria Falls Town prior to your selected morning or afternoon departure time. Board a private vehicle and head to the Victoria Falls, a World Heritage Site and iconic natural wonder. Upon arrival, take a guided walking safari through the rain forest with your guide, who will share with you a brief history of the falls and point out some of the native plants and animals. Take time to enjoy the view of the falls from various vantage points along the way — your guide will provide you with a raincoat if the spray becomes heavy. Return to your hotel at the end of the tour.